July 24, 2018, El Cajon, CA – Round 6 of the Lucas Oil Off-Road Racing Series would take place at Wild West Motorsports Park in Sparks, NV. With extreme elevation changes, ultra-high speeds, and ever changing weather conditions, the racing was sure to be exciting. After 5 rounds of racing, Jerett Brooks would arrive in Sparks sitting in 4th place in the Championship standings with hopes of narrowing the gap between himself and points leader, Rob MacCachren. After 3 practice sessions on Friday, a few changes to the truck, and a final qualifying session during the day on Saturday, Jerett would start round 6 under the lights Saturday night on the outside of row 3. Not ideal, but nothing Jerett hasn’t been able to overcome already this year. With the crowd on their feet and the green flag waving, 11 900-horsepower trucks would race up the hill into turn 1 at almost 100 MPH. Jerett launched himself off the ski-jump out of turn 1 in 5th place behind Brian Deegan, Bradley Morris, Rob MacCachren, and Rodrigo Ampudia. After 5 laps, Jerett eventually received some pressure from Jeremy McGrath as the reigning champ started to chip away at the position. Eventually losing the spot, Jerett was sitting in 6thplace during the competition caution. Before the restart, spotter and crew chief, John Hoffman, would remind Jerett to focus on his lines and concentrate on finding his way up to a podium position. John’s words of encouragement were well-received. On the restart, Jerett took the far outside line and cashed in on a 3 truck pass, moving up to 3rd place behind only Bradley Morris and Brian Deegan. Little by little, he chipped away at the leaders, ultimately preventing himself from losing his podium position to a hard-charging Rodrigo Ampudia. Unable to improve his spot in the finishing order, Jerett still managed to take home a 3rd place with championship leaders Rob Mac, RJ Anderson, and Jeremy McGrath all finishing behind him. On the podium, Jerett said “I really didn’t have much for these guys in the first half of the race. But I made an aggressive move in turn 1 on the restart and it couldn’t have worked out better. For the whole second half of the race, I really don’t think I’ve ever felt better in this Pro 2. I can’t thank my crew enough for working their butts off and huge thanks to Rigid Industries, Toyo Tires, Bilstein, KMC, and everyone else who helps me out! After 6 rounds of racing and 4 podium finishes, Jerett sits in 2nd place in the points championship, 33 points behind Rob MacCachren, and 3 points ahead of RJ Anderson. 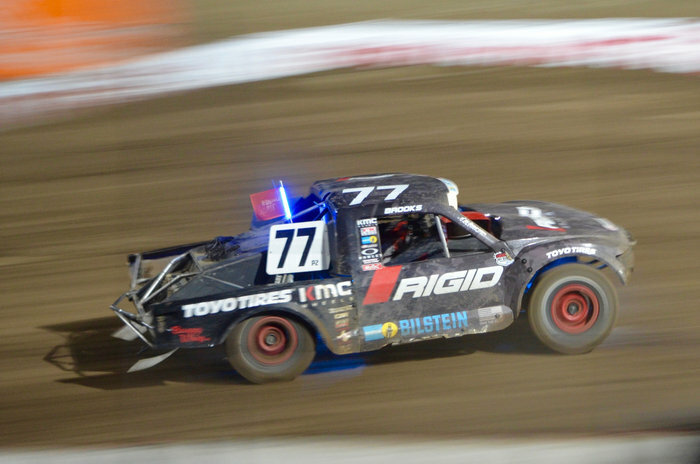 Rounds 7 and 8 will take place under the lights at Utah Motorsports Campus in Tooele, UT.